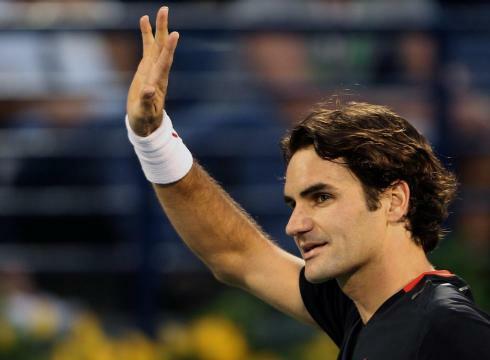 Roger Federer won his 7th straight match and improved his record to 14-2 on the 2012 season with a 63 64 victory over Mikhail Youzhny in the quarterfinals of the Dubai Duty Free Championships. Federer now holds a 12-0 head-to-head record over the Russian. Roger never really had any trouble throughout the match. He broke Youzhny's serve early in the first set to take a 4-1 lead, and then held out to win the set 6-3. The second set was very much the same, with Fed breaking in the opening game and then riding out the set, and thus the match, on the strength of his service games. Youzhny was inconsistent throughout the match, but Federer did not give him much to work with on the return as he was hitting his first and second serves equally well. Roger's first serve was clicking at only 54%, but that was alright because he won a whopping 80% of his second serve points. He also did not face a break point in the match, the second consecutive time that has happened. To fellow Federer fans I have talked to, one concern that they have had is that Federer is not returning well this week, or at least not returning as well as he was at the Australian Open or Rotterdam. While that may be true, it is not harming him at all due to the fact that he is serving very well. Not only that, he is backing up his serve with solid baseline play, and his 2nd serve is deceptive enough to also win him a fair share of free points off missed returns. The one thing I have noticed in all three matches this week is that Fed has hit many nonreturnable serves, which allows him to breeze through his service games with ease. Because of his ability to ease through his holds, he has more freedom to be looser on the return. Of the times that he does get the opponent's serve into play, he is winning the majority of those points off the current strength of his all-round game. In the quarters against Youzhny, particularly, Roger broke early in both sets, and after he did break, he did not feel the need to expend more energy to break again as he was confident in his ability to hold. This is a good thing for the Maestro because when he has confidence on his serve everything falls into place. This seems to be the status quo with Fed these days; in the early rounds of tournaments, he only does what he needs to do to win. Dominating a match is not important to him if he is not feeling threatened by the ability of his opponent to make him feel uncomfortable. This was largely the case against Llodra, Lopez, and now Youzhny. In the other three matches on the day, Andy Murray, Novak Djokovic, and Juan Martin del Potro all advanced to the semifinals. Murray dispatched of the #5 seed Tomas Berdych 63 75. Murray never really had trouble and the Czech never put himself in a position to do any damage. Murray has looked very solid since a shaky opening round match in which he needed to win 6-4 in the 3rd set. Novak Djokovic overcame countryman Janko Tipsarevic 61 76(6). The first set was completely dominated by Novak, but then in the 2nd Janko started to play much better and he was getting more and more confident with every passing hold. In the tiebreak, he held a 4-1 advantage and then a set point, but could not convert, and Djokovic took the breaker and the match, eight points to six. Juan Martin del Potro defeated #4 seed Jo-Wilfried Tsonga 76(1) 62. The first set was very even with the exception of the tiebreak, and then the big Argentine cruised from there. The two semifinal matches in Dubai are equally as intriguing. Federer plays del Potro in a rematch of the Rotterdam final, and Djokovic plays Murray in a rematch of their Australian Open semifinal last month. Both matches could be won by either player. Murray has looked sharp after his first round scare, and Djokovic has looked shaky at times in his past two matches. However, Novak has the mental edge knowing that he defeated Murray last month under very challenging circumstances. Take your pick. In the other semi, both Fed and Delpo have been playing great all week, neither dropping a set en route to this point in the draw. Del Potro has plenty of confidence after his title win in Marseille last week, but so does Roger after his title win in Rotterdam, where of course he beat the Argentine. Whether or not that plays any effect into the upcoming match will have to be seen once play gets underway. The ball will bounce higher in Dubai than they did in Rotterdam, with it being an outdoor court, which means that more balls will be going into Delpo's strike zone. Federer must be careful to avoid this by using all the variety that he used in the Rotterdam win. He also must serve well, as he has done all week, and will probably need to return much better as Delpo is much more capable of backing up his serve with a great baseline game, unlike Llodra, Lopez, and Youzhny. The return is important because Roger can avoid getting pushed around the court if he can immediately get the advantage in the point by hitting a solid, deep return. I look forward to the great day of Dubai semifinal action ahead!